According to a research report published by Transparency Market Research, the value of the global corrosion inhibitors market was pinned at US$5.20 billion in the year 2012 and this is expected to grow to a value of US$7.14 billion by the end of 2019. The report “Corrosion Inhibitors (Organic and Inorganic) Market - Global Industry Analysis, Size, Share, Growth, Trends and Forecast, 2013 – 2019” also indicated that the corrosion inhibitors market is projected to witness an annual growth of 4.7%. As far as the total volume of corrosion inhibitors was concerned, the aggregate figure in 2012 stood at 4,425.9 kilo tons and this is anticipated to increase at a 4.4% CAGR over the forecast period of 2013-2019. The research report studies the global corrosion inhibitors market by product, application, end-use, and geography. By product, corrosion inhibitors are bifurcated into organic and inorganic. By application, the corrosion inhibitors market is segmented into oil or solvent based and water based. The key end-uses of corrosion inhibitors include power generation, metals processing, chemicals processing, oil and gas, pulp and paper, and others. Geographically, the corrosion inhibitors market is divided into North America, Europe, Asia-Pacific, and Rest of the World. While Asia-Pacific held the largest share (more than 35%) of the corrosion inhibitors market in terms of demand in 2012, the North American and European corrosion inhibitors markets jointly held more than 50% of the global demand in the same year. Surge in industrial development, increase in construction activities, and rise in awareness about the negative effect of corrosion have all contributed to the growth of the corrosion inhibitors markets in these regions. Within the product segment, organic corrosion inhibitors led the market with 70% of the total market share in 2012. Water-based corrosion inhibitors dominated the application segment, enjoying more than 75% of the share in the same year. 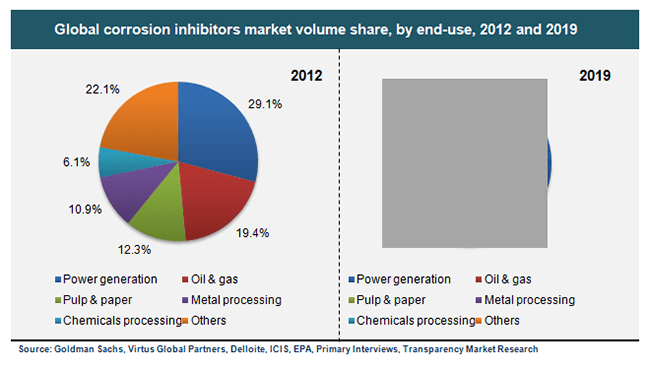 In terms of end-use, while power generation led the corrosion inhibitors market with 25% of the global demand in 2012, oil and gas came in second with 19.4% of the total share. Offering a detailed analysis of the competitive landscape of the global corrosion inhibitors market, the research report discusses aspects such as financial standing, recent developments, product portfolio, and industry share. The leading vendors of the corrosion inhibitors market mentioned in the research study are Ecolab, Solutia Inc., AkzoNobel N.V., Champion Technologies Inc., Cytec Industries Inc., Henkel AG & Company, KGaA, W.R. Grace & Co., Dai-Ichi Karkaria Ltd., Marott Graphic Services, Ashland Inc., Cortec Corporation, Dow Chemical Company, The Lubrizol Corporation, Daubert Cromwell LLC, BASF SE, and GE Water & Process Technologies. Among these, Ecolab dominated the corrosion inhibitors market in terms of manufacturing, accounting for more than 15% of the overall market share in 2012. With the top four market players enjoying below 40% of the global market share in the same year, the corrosion inhibitors market is quite fragmented by nature.